Use the clicker to help eliminate puppy nipping. All puppies like to play and wrestle and nip each other. When they come to live with people, they want to play in the same way. They don't know that our skin is far more tender than their littermate's fur—so sometimes those nips can hurt! In the litter, mother dogs and littermates teach a puppy when he's biting too hard. Mom gets up and leaves; littermates yip and stop playing. A puppy that has been taken from the litter too young, or that has no littermates, may be particularly nippy because it did not have a chance to learn "bite inhibition" the natural way. Teething may also be a cause of nipping, as the puppy wants something in its mouth to chew on and will grab hold of anything at first. Management combined with operant conditioning principles is the best line of defense. Don't let the puppy play with your hands or clothes. Simply stop the fun, and leave. If biting always stops the fun, biting at hands and clothes will occur less often. Often this is enough to extinguish playful nipping, but probably not enough to extinguish nipping due to teething discomfort. Have a safe and comfortable spot where you can leave the puppy when you cannot play with him or watch him; an X pen with his bedding and some toys in it, or an area fenced off with baby gates. Nippy puppies go back to their own space for a while. When the puppy grabs you or your clothing, stop moving. The movement seems like play to the dog. The fun is gone if you are still. When the puppy grabs a hand or sweater, for example, disengage him gently and provide a suitable replacement—a chew toy—instead. 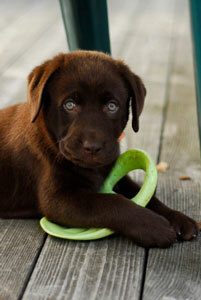 Keep a couple of chewable replacements for your clothes and hands handy in each room where the puppy spends time. Ideas: rawhide, toys, knotted rope, an old sock with a tennis ball in it, empty marrow bone. Rotate the chew toys. Give your puppy something permissible to chew on, while you scratch his back and belly. This helps him to learn that some things are OK to chew on. Many puppies have learned in this way to grab a chew toy before they come over to you, as a way of telling you that they know what the rules for safe play are! Reinforce that with the scratching and rubbing they want! Play "I'm OK with that!" Teaching the puppy to use his mouth gently is an important part of training. Doing it the clicker way creates clear communication without punishment. This technique is very simple, and very powerful. You are simply rewarding the puppy for choosing not to nip. When the puppy makes the right choice, he earns his click and reward! You are helping him learn to make good decisions! Please do it carefully to avoid small injuries to yourself. Follow these easy step-by-step instructions for using the clicker to help eliminate puppy nipping.Teaching the puppy to use his mouth gently is an important part of training. Take your closed fist and put it in front of the puppy's face. Click and treat if he doesn't nip—even for a second! Repeat this. If your puppy bumps his soft nose against your fist, that's great. Click this! Next, take your closed fist and wave it slowly around in front of the puppy. If your puppy does not try and nip you right away, click and treat. Repeat this several times. Raise the criteria for a click by both lengthening the amount of time the puppy can have your fist in front of his nose without nipping, and by altering the distance from his face and the speed of your hand flying around his face. Repeat this exercise with a toy or chew bone. Click and treat for calmness and for waiting rather than grabbing at the object. If at any time he tries to nip, stop, put your fist or other object out of sight and start again a little further away. When you have clicked and treated him several times for staying calm, click and give him the object and let him enjoy it. He is learning that you will give him nice things but only if he waits for permission. Repeat this at several distances around the puppy's nose and mouth. Be sure to do this several times during the day. Do the same with your open hand. Do the same with your index finger. Try it with your shoes and your clothing. Your puppy can definitely learn not to nip things that are near his face, and since this is when most nipping occurs, reinforcing his correct choices is crucial. You should see immediate improvement with this technique, but because he's a puppy, you'll need to repeat it over and over, especially when you have tempting smells on your clothes and hands! Prepare a dozen or more tiny treats—pea-sized bits of cheese or chicken, say. Or, for a very small breed of puppy (and sometimes they have very sharp little teeth) a dab of baby food meat on the end of a chopstick. Click and treat the puppy two or three times just for coming to you, so he knows that treats are available. Now offer the puppy something tempting to grab—a toy or a piece of cloth. Click when he grabs it, and hold out the treat. If he lets go to eat the treat, click again. Do not click him if he grabs something you do not want him to grab! Repeat this several times, until the puppy quickly drops the object when he hears the click. Now start saying "Open" just before you click. Repeat several times. This begins the process of putting "open" on a verbal cue. Next, say "Open" and pause. Hold the object quietly (do not pull) until the puppy lets go on his own. At the moment the puppy releases the object, click and treat. Do NOT click until the puppy releases! Remember, click as he lets go, and give him a treat. Repeat. Repeat this little lesson later in the day or the next day, until he will drop the object eagerly when you say "Open." Keep dry treats and clickers handy whenever the puppy is loose in the room. If he grabs a hand or your clothing, become still then say "Open!" If he lets go, be ready to make a great fuss and give him a special treat. Everyone in the family can learn this cue and use it.Keep dry treats and clickers handy whenever the puppy is loose in the room. This is a great cue for children to use if they are worried about nipping. When the puppy shows signs of getting nippy, take your hands away and stand up. Watch closely for the moment he closes his mouth. Click, treat! Repeat whenever you get the chance. Start giving the cue, "Close mouth," before taking your hands away. Then take your hands away; click and treat him when he closes his mouth. Teach the children to do the same. They feel safer when they can say "Close mouth" and the puppy does it. For the puppy, it's a "Clicker Opportunity," not a rebuke! Submitted by vickifb on Thu, 2011/03/03 - 1:36pm. I am so glad i have found this site! it is such a relief to see that puppy nipping is a normal stage and that other people have worked through it with their dogs. We have recently brought home an 11 week old border collie who is wonderful in every way until he gets over excited playing, thats when he starts trying to bite us wherever he can reach! my 6 year old refuses to go near the puppy as he is so scared of being bitten, this however seems to make the dog more determined that my son is the one he wants to play with the most. with my son it seems to be gentler than with me and my partner, there have been times when he has lunged for our faces, all teeth on show and it has got to the stage where i am also starting to feel slightly scared of the dog and i shout to tell him off. i know this is not the right thing to do but when you want him to get off it seems to be the only thing that works. i realise that clicker training takes alot of commitment which i am prepared for does anyone have any advice on the best exercise to start him with? Submitted by smart dog university on Tue, 2011/08/16 - 1:56pm. I'm glad you're considering clicker training for your pup! I love it, especially for pups! For the bitey-bitey times, keep your pup on a leash, especially if your six year old is around. You can limit how close your pup gets to your child which will decrease the amount of teeth-on-skin time and will likely boost your child's comfort level when around the dog. At the same time, teach your son how to pet the dog on his chin (not on the top of the pup's head) for a few seconds, then to simply walk away before the pup can get too wound up. A supervising adult will be right there, of course, helping both pup and child, and offering reinforcement for appropriate behavior! close your mouth cue to use stop barking? Submitted by Jansje on Sun, 2011/08/07 - 4:53am. I suddenly realised that maybe if you put closing your mouth under cue you might also could use it to stop barking. Who thinks this will be possible? Or would I get a dog that is barking with its mouth closed? Submitted by Gillie on Sat, 2010/11/20 - 8:55am. I am just starting to use the clicker with our 13 week old Lurcher pup. She does like treats & when in the mood for them the training seems to go very well.. but sometimes is just not interested in them. I have tried toys as a treat but that did not work. She seems to have a really short attention span and sometimes is totally disinterested in even playing! We are having nipping problems with her especially with my husband & would like to try the methods here... but if she is not interested in the treats what can I reward her with?? Submitted by Laurie Luck on Mon, 2010/11/22 - 1:36pm. Thanks for the questions - they're good ones! Are you picking the food bowl up after you you feed your pup or does she have free access to her food all day? Also, what are you using as treats? It's more difficult to work with free-fed dogs (dogs who have access to their food all day), because if they've just eaten, they're probably not very interested in what you've got to offer. Think about it this way: if you're making several stops at relative's houses on Thanksgiving, you're not going to eat as much at the second house as you did at the first house because you'll be full already. And if there's a third and fourth stop, you'll probably eat even less at those houses! Same thing with the dogs - food isn't a reinforcer if they've got access to it all the time whenever they want. Also, the value of the treat is important as well. Something soft, small (the size of a pea), and smelly usually does the trick. Assuming your dog doesn't have any food allergies, you could try diced chicken, steak, salmon, string cheese, etc. Hard, crunchy, and dry treats are usually very low value. I hope these ideas help you find a valuable reinforcer for your pup! Submitted by gla2phx on Fri, 2010/11/05 - 12:29pm. I have an 18 week Labradooble puppy who is constantly nipping at me - my arms are full of scratches and numerous shorts and t-shirts have holes. I have tried turning my back when she starts, but then she just goes for the back of my legs or shorts. I am very scared this will progress into something more dangerous as I do not trust her right now. I have never had this be a problem with any of my other dogs and am getting exasperated. Submitted by Laurie Luck on Tue, 2010/11/09 - 3:20pm. Thanks for the comment and question about your puppy's nipping. It's good that you're able to predict when this will happen - you say it happens after breakfast, mid-afternoon, then at night. You can use that knowledge to help teach your pup appropriate behavior. First, it may help if you have baby gates installed. I like to use the baby gate as a barrier between myself and the pup. When the pup starts nipping, I can simply step over the gate and am now no longer available for the puppy. I'll wait on the other side (silently) for 5-10 seconds, then step back over the gate. I'll also bring a suitable chew toy for the pup back over with me. I'll hand the pup the chew toy and calmly praise him. If he starts to chomp on me instead, back over the baby gate I go. It won't take long at all -- if you're consistent -- for your pup to realize that his nipping makes you go away, while his chewing on the puppy toy makes you stay around. If baby gates aren't practical for your house, you can use a tether instead. Of course, you would only tether your pup when you're around to supervise. The tether works very much like the baby gates. It allows you to walk away from the pup and his biting, instead of having the pup continue to follow you as you turn yoru back on him. Also, you can try to engage your pup with appropriate play behaviors (chase the toy, retrieve the toy, etc.) right before you expect the nipping episodes. You're trying to be proactive and get your pup engaged in an appropriate activity before he gets the chance to start the nipping. I hope this provides some assistance to you as you continue your pup's training. constant nipping using a tether? Submitted by Jansje on Fri, 2011/08/05 - 4:08pm. I am from the Netherlands and I don't understand what a tether is. Is it a leash? I can't find a translation for the word that fits in the article. My Standard Poodle pup, now 18 weeks is ofcourse biting and nipping. She already respons very wel to the cue sit, so if she is biting I let her sit, and then start a tug play with a soft rope. But somtimes she only wants to bite in me then I will give her a time out in her bench for a minute or so. I always get her in with some treats. Afterwards she has calmed down, then I will take her for a walk or do some clickertraining. The first weeks were the hardest. Then she was asleep or biting. I wish I had read the advices sooner. I will also try the clicker aproach and the open/close mouth. If you have any suggestions to my aproach I am very intrested in them. Submitted by Lynette77 on Tue, 2010/08/24 - 3:32am. We have a 11 1/2 week old border collie puppy who is adorable but nips and bites really hard when he sits with us. I have read some of the articles here and am going to start clicker training with him asap because when we allow him to come and sit with us he jumps up and bites hands or arms to get attention or if he's sitting at your feet he tried to bite them or your clothing. We have tried discouraging him by giving him his Kong toys to chew but he ignores them and goes for fingers. As he is getting bigger he is biting harder and has even broken the skin on occassion. We are totally against aggressive play so we try to keep the environment calm for him but he seems to be getting worse. We put him back in his pen each time he bites but it has not deterred him yet. I would be grateful if someone could tell me that there is light at the end of the tunnel with this. He is a wonderful puppy but I do not want him to grow up being aggressive or learning that it's OK to bite people! Submitted by precalc on Sat, 2010/08/07 - 4:46pm. Am I understanding that? If so, how is it that you are to "Repeat this several times, until the puppy quickly drops the object when he hears the click"? Which click? Aren't you clicking after the puppy drops the toy? How will he learn to drop the object when he hears the click if you don't click until he is already dropping the toy? I know you click when he first picks up the toy, but surely the point isn't to teach him to drop every toy he picks up! Submitted by Torotto on Sun, 2010/10/31 - 5:16am. The idea is to learn the puppy to know the word "open", not to get the dog to pick up toys to drop them..! Submitted by BarbieDragon on Fri, 2010/06/25 - 3:53pm. Submitted by tcote on Wed, 2010/02/10 - 2:48pm. my 4 month old newfie is growling at my kids, biting their clothes. When I try to get him to stop, he growls, shows his teeth, and trys to bite me. I am on the verge of giving him away. Submitted by EmmiS. on Tue, 2011/01/04 - 3:00pm. I'm so glad you looked on this website for help. My dog (now 6) is reactive (his fear is people and he growls, lunges, etc.) and clicker training has helped exponentially. What I recommend is this: make sure your children follow certain behavior rules around the dog. 3. Stand up straight and ignore the dog unless he behaves properly. Before petting him, he must sit. 1. Sit (an easy, quickly learned command) and then working on basic command like stay, down, come, etc. Make sure his "sit" is bomb-proof and work on it in all situations. 2. Leash the dog around the house and tie the leash sround your waist and/or baby-gate him in one room. If leashing him just gets him excited and encourages chewing on the leash, he may be too young and in that case, baby-gate him in a seperate room. The kitchen is preferable because of relatively high activity level and tiled floor. Put him in his crate when he is tired (gets hyper, starts to fall asleep, has been awake for two-three hours, etc.). He is like a child and you know best, don't wait for him to collapse with exhasustion after getting hyper and nipping and engaging in all types of misbehavior. 3. You control all good things, i.e. he only gets food, treats, toys and pats once he does something good. You pick up all toys from the ground and he gets meals at certain times. 4. You are in charge and he must learn this one way or another. The best way for him to learn this is to spend a lot of quality time with him all the while enforcing correct behavior. Train, train, train! Encourage the children to clicker train him and monitor them and work on correct training technique. Make sure to always back them up if the dog is not listening or begins to misbehavior. 5. Lastly, he is a puppy! Don't forget but forgive and work with him. He learns everything from your action or inaction. Everything you do is a reinforcer of his behavior. Best of luck and I encourage you to read clicker training books or even better, enroll in a clicker training puppy class and then you will have personal advice and hands-on help. Submitted by Alyssa_Walker on Fri, 2010/03/05 - 9:16pm. If he's turning on you when you try to stop him, you are either being too aggressive about it or he's associating your stopping him as being more play. How are your kids interacting with him? If they are flailing around, roughing him up, or being excitable with him, this will cause him to associate them as play-things. Teach your kids to be calm with the puppy, rather than playful. Everyone wants a puppy so they can play roughly with it, or so their children can, without realizing that playing with a puppy roughly means the puppy will play rough back by biting, jumping, growling. ALL interaction between the kids and the puppy should be closely supervised so you can make sure the kids behave appropriately and so you can send the puppy immediately to a time-out (in a bathroom or crate) when he starts nipping, etc. The kids should always have a toy with them so the puppy has something to chew on instead of them, and they should stick it in the puppy's mouth right away. This stage will pass, but only if you're consistent. If you give up or if the puppy is accidentally rewarded too often for nipping, he'll always be that way. Do not approach the puppy will develop the habit and be that way into adulthood. Just stay on it and he'll start to figure out the fun is over as soon as he starts nipping. I usually strongly discourage puppies for families with small children because most people can't handle the training necessary to prevent the children from teaching the puppy bad behaviors. Submitted by Fran71 on Thu, 2010/02/04 - 12:14pm. I too have a very nippy puppy - an 8 week old Working Cocker Spaniel. She particularly likes having a go at my two daughters tights when they come home from school!! Submitted by mummy_of1 on Thu, 2009/12/24 - 8:45am. she seems too young to use the clicking method or the treat with the fist shaking in front of her as she bites at me and everything else that moves or is chewable any suggestions as to train a pup at this age? Submitted by Alyssa_Walker on Fri, 2010/03/05 - 9:19pm. So long as the puppy can see, hear, smell, the puppy is learning and is NOT too young for the clicker! In fact, this is the BEST time to get her started! Puppies are like sponges at this stage and will pick up on training faster than an adult dog. AND it will wear her little brain out so she's not finding OTHEr routes for her growing intellect to practice on! DEFINITELY use the clicker! Force yourself to be consistent with this training on a daily basis and test it out for yourself. Just be sure to start at a level she's prepared to handle. A moving object, like a shaking fist, might just be too much of a temptation for her right now, so try just holding your fist still. Tone it down based on her age, if you feel you need to, but DEFINITELY try these techniques. Submitted by BarbieDragon on Fri, 2010/06/25 - 3:35pm. Some breeders start clicker training at the age of 4 weeks! Submitted by Dynamutt on Sun, 2009/11/29 - 8:11pm. This article has been a Godsend! I was feeling very frustrated with my 15 week old working-lined Malinois for being so mouthy, as I have been bitten in the face (drawing blood) twice already. I am grateful for these positive solutions that do not involve unfair corrections with prong collars, e-collars, or "how to be dominant over your puppy" articles as seen on other sites. Thank you! Submitted by aliyahandannika on Fri, 2008/09/05 - 11:25am. Submitted by flaren on Mon, 2008/08/11 - 2:26pm. I do have a follow-up question to this. My puppy has figured out that the click means "good" and stops and looks to me for the reward, but when I sue food treats with him, he really does a number on my hands trying to get the treat, very excited biting and very grabby. Any suggestions on how to work on this? Submitted by Rev on Fri, 2009/12/11 - 3:02pm. You don't have to hand the puppy his treats; you can drop them on the floor so he doesn't automatically go for your fingers. Keeping them in a dish by your side instead of "on" you can help that too. Then you need to teach the puppy self-control--when he goes after your hands ignore him (if you can) until he gives it up, then when he turns away even for a second, click and treat. He gets treats only when he's not grabbing. You can graduate to holding a treat in the closed hand, then actually give the treat from the other hand; or opening the hand only when he's earned a click for ignoring it. Submitted by flaren on Mon, 2008/08/11 - 9:30am. This is the puppy primer I've needed! We've got a toe-nibbling finger-nipper when he's excited, and I've been wracking my brain trying to figure out a way to get him to stop. Now I can't wait for our next training session! Open does not mean "chew"
Submitted by Sally Deiwert on Thu, 2007/12/13 - 12:39pm. I tried the "Open" clicking with my 12? month old shelter dog. She has been making progress with other clicker training, but this just doesn't seem to work. When she grabs what I hold out she immediately starts chewing on it and wont let it go unless I take it from her. Even for a treat. It seems chewing is more of a need than treating at that point, and she is what I call an Extreme chewer, destroying Nylabones, etc. in a matter of several minutes. Do I hold out and click hoping she will eventually drop it? It may take a while and by then the item is in danger of being swallowed in pieces. Thanks from Sally, golden/border mix? Submitted by Dogsarelove on Sat, 2007/08/11 - 12:45pm. Thanks for this article. I have a puppy with a nipping problem and I plan to use this advice. I will let you know how it works out! Three minutes to "open your mouth!" Submitted by aeonius on Thu, 2007/03/01 - 9:19pm. I am completely amazed! My german shepherd puppy, bred for generations for a great prey instinct, learned the open command in less than 5 minutes. Thank you for this wonderful and truly fun article!